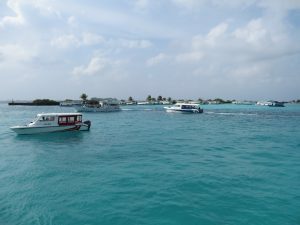 From the moment we had our first glimpse of the coral atolls of The Maldives, we were in love. 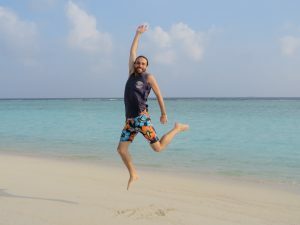 The Maldives has always been an extremely expensive luxury travel destination. This was the result of government policy limiting tourists to specific resort islands, and not allowing them to stay on any other islands. 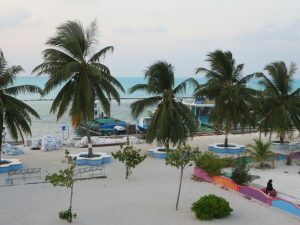 This gave a monopoly to the resort operators on the small number of resort islands, with the predictable market distortion – rooms on resort islands were hundreds of dollars per night. 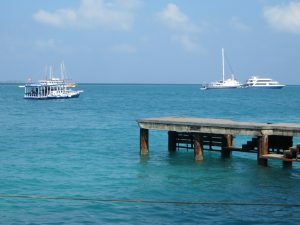 The speedboat access to the resort islands is USD$150 per person. It is simply out of the reach of budget travellers such as ourselves. 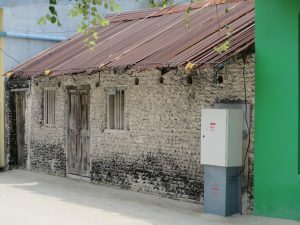 A few years ago, however, the government decided to allow regular Maldivians to operate homestay and guesthouse accommodation in the villages on all the islands. We were able to find a room for just USD$23 per night! Add in a super-discounted airfare, and suddenly, a trip to the Maldives was on our radar. The Maldives has its own script, which looks Arabic-influenced. It also takes a bit of brain-twisting to see it as an alphabet, when you are accustomed to European and Sankrit-based alphabets. Outside the front of the airport terminal was an impossibly aqua tropical ocean. Directly outside the front door of the terminal. Across the road. It is impossible to express what it is like, having emerged from the front doors of so many airport terminals in so many places in the world over the past three years, and every single time having faced a wall of buses, billboards, and buildings, to step into the sunshine and see this. The Maldives is an entire country composed of coral. 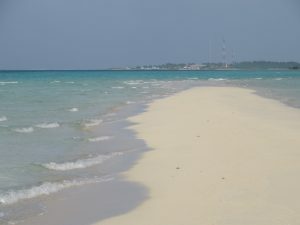 All the “dirt” on all the islands is white, white coral sand. All the vegetation is coconut palms and sand dune scrubby bushes (except for the imported plants in heavily-maintained resort gardens). 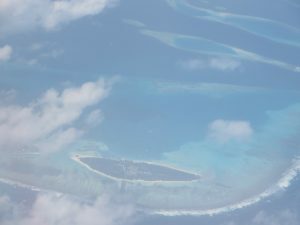 And all the water is very shallow, because the country is a series of coral atolls, so most of the open water is actually atoll lagoons. The shallow water together with the white, white sand creates water of a stunning, bright aqua shade that is almost impossible to capture with a camera. The airport is actually on another island, close to the city of Male, but we decided not to get the shuttle to the “big smoke” the day we arrived. 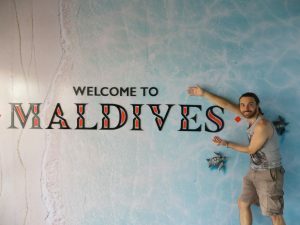 We found a guesthouse on Hulhumale, the airport island, and took our time settling in to a new country. 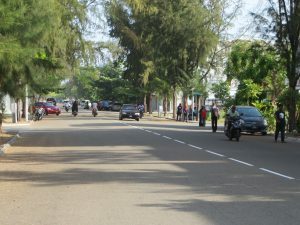 The streets of Hulhumale are wide, well-paved and guttered, and almost empty. 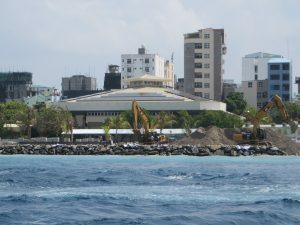 This will change in a couple of years, when a bridge is built from Male city to Hulhumale. But for now, it is beautifully restful to wander the streets. 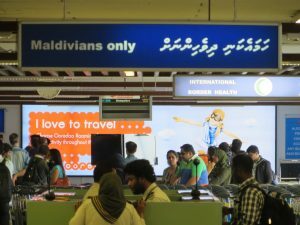 Many people in the Maldives speak quite good English, at least in Male and on Hulhumale, where they are accustomed to dealing with tourists. We were able to buy SIM cards and get data plans, and locate a good restaurant for dinner, without any trouble. 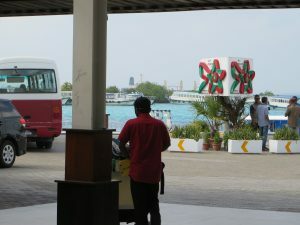 The next morning, we took the shuttle to Male city, and a taxi to the inter-island ferry wharf. As we departed, we could see construction equipment busily reclaiming more land. 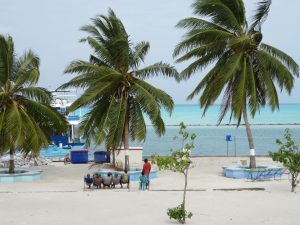 Male city is one of the most densely-populated areas in the world, and the water is fairly shallow, so the temptation to expand the island is understandable. Male also has a huge port area, because just about everything is imported. As our guide on Gaafaru explained “all we have here naturally is fish and coconuts”. Everything apart from seafood and coconuts is imported. There is not even enough nutrition in the sandy soil in its natural state to support bamboo. The traditional housing is made from coral rocks! 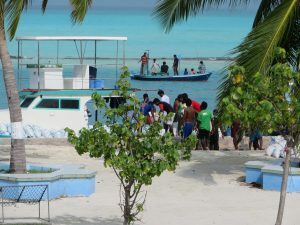 The ferry ride up the middle of Male Atoll took several hours (who knew a coral atoll could grow so big? 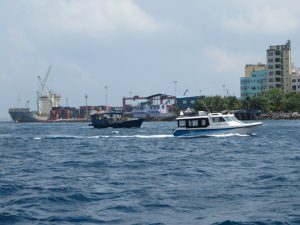 ), and we were very happy to get our first glimpse of Gaafaru, the island that would be our home for a week. The communication towers were a good sign – we had been able to get signal on our mobile phones for most of the journey, even when there was no land in sight, so we hoped to have decent internet speeds and be able to get some work done. 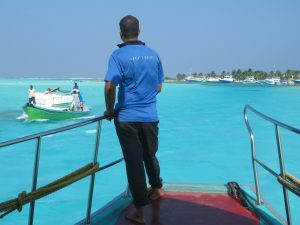 The water here was even more spectacularly-coloured than the water around Male – and that is saying something! Even though this picture is amazing, the colour in reality was even more intense. Every shade of water on a coral atoll is a shade that makes Jenny happy, just by hitting her eyeballs. The boats are all painted in bright, cheerful colours on the same palette as the ocean, which adds to the picture-book feeling of the place. The women, on the other hand, tend toward black tents, especially on the outer islands. 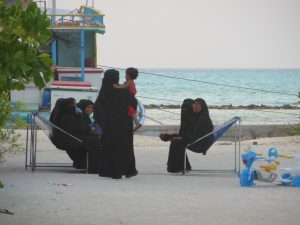 In Male and Hulhumale, there seemed to be a bit more freedom of choice in wearing colours, even if the level of covering-up was the same. The Maldives is an extremely Muslim country. Dogs are a prohibited import (something which made us quite happy, as it means the cats are safer), along with alcohol (although the resort islands seem to be able to bypass that restriction). According to official statistics, the population is 100% Sunni Muslim. We are used to Muslim areas, wearing extra clothes, and swimming in shorts and a T-shirt, so we didn’t need to make much of an adjustment. 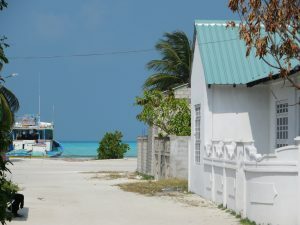 Gaafaru is a tiny island – you can walk from one side to the other in just a few minutes. 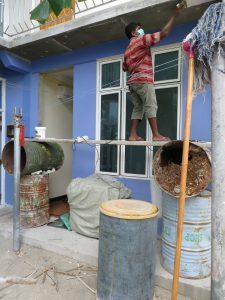 It has a population of 1300, most of whom live in single-storey dwellings, The traditional coral rock houses are gradually being replaced by or remodeled into concrete rendered buildings. There is a school, a clinic, a government office, three coffee houses, and one (relatively new) restaurant, which had been opened in anticipation of tourists. We stayed in the first completed room in the first guesthouse to be built on the island. It was still under construction, and we spent several horrified minutes per day contemplating the “scaffolding” the builders were using. We could see that there were two other multi-storey buildings under construction, and were told they would also be guesthouses. We considered ourselves to be lucky to have visited this place so early in its tourist destination journey, when the local people were not yet jaded by ignorant or insensitive foreigners. Many of them actually seemed slightly afraid of us! We spent a chunk of time each day in the restaurant. O ne of the few multi-storey buildings on the island, it had a great view of the wharf area, and we could watch the moments of excitement when the daily ferry either arrived or left (it would arrive one day, and leave the next day). Vegetarian options were somewhat limited, but the curries were tasty, and the roti-style pan bread was a huge winner. On our strolls to and from the restaurant, we greeted people with “salaam aleikam”, the Muslim greeting which means “peace be with you”. Some were visibly startled the first time! Over the course of the week, though, we started to have more smiles, and even some chats. People generally use the outside of their house as a sort of lounge room, rather than tucking themselves away inside, especially around sunset. T he Gaafaru sofa, as we called it, is a metal frame strung with fishing net. Most houses have one of these with three or four compartments beside the front door. In the evening, you can see a row of faces along the street, illuminated by the glow of their smartphone screens. One day, we came across a naked hermit crab on the street, struggling to make its way away from its smashed shell. (We suspect it may have been run over by The Only Truck On The Island.) Although the ocean is never more than 400m away, we weren’t sure this critter would go in a straight line, or would survive without a shell for so long. We decided to carry it to the sea shore, where there were plenty of shells to choose from. As it turned out, there weren’t so many shells to choose from! Shell after shell that we turned over already had a hermit crab inside it. Eventually, we found one that might do, even if it was perhaps a little large. Herman (or Hermione, we couldn’t really tell), stuck their front into the shell, had a feel around, and then pulled out, swung around, and reversed in. With an enormous power-to-weight ratio, he/she hefted the massive shell up off Ravi’s palm, and started walking with it toward his fingers. More confident in its chances of survival now that it was on the beach and in a shell, we left it near the water’s edge and went for a swim. When we came back, it had moved some distance, which was a good sign, but it didn’t fold up into its shell at the vibration of our feet (as all the other hermit crabs did), so we were still worried. We will have to take the worry to our graves, because when we went back the next day, there was no sign of the new shell, or Herman/Hermione. At the end of every street is the ocean. To be fair, on two sides of the island there are scrubby trees at the end of the street, so you can’t quite see through them to the water, but the water is this close, whether you can see it or not. We went for a sunset swim most days. One highlight of our time on Gaafaru was a snorkelling trip to “the sandbank” – an island in the making, which is only exposed at low tide. 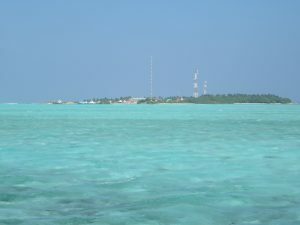 This is the view from the sandbank back to the island of Gaafaru. 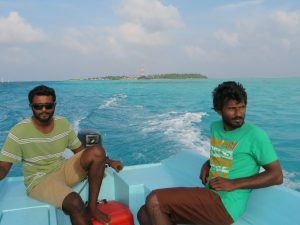 JoeRay has enlisted a friend with a boat to take us out to the sandbank, and we had yet another journey across the impossibly-coloured water to the sandbank. We passed up on the opportunity to eat barbecued fish on the sandbank (there were no vegetarian options for the barbecue, and we really didn’t have spending money for such things), but we really enjoyed seeing the vast schools of tropical fish that just hang around everywhere in the Maldives. Being somewhere with other people gave us a rare opportunity to have our photo taken together. 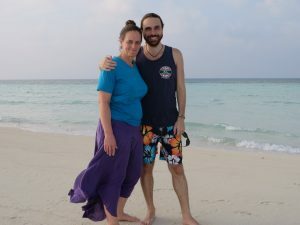 One minor missing for us was animals – there are no dogs in the Maldives at all, and after the ubiquitous cows and urban pigs in India, there was a somewhat sterile quality to a human settlement without companion animals. We saw cats, but they were very much wildlife, and came nowhere near the human beings. The idea that one might have a cat in the house seemed unusual when we mentioned it to our guide, JoeRay. While it seems idyllic to live in a place where water this colour is all around you every day, the absence of kitty fluff is a dealbreaker for us. You’re a nice place to visit, Gaafaru, but we wouldn’t want to live here. That said, we had a great working holiday here for a week, and can thoroughly recommend this place for digital nomads needing a change of scene. The mobile data speed was quite acceptable, and the views from the office were magnificent. For us, this was the perfect place to go after 90 days in India on a double-entry six-month visa.